Boxcutters, Jigger, Mixing-glass, Citrus Juicer, Strainer, Stirrer (long Spoon), Rocks Glass, Cup. To Juice Clementines, halve and squeeze through a fine mesh sieve. 6 clementines should yield about 1/2 cup juice. 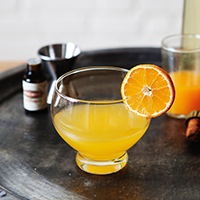 In a Mixing-Glass filled with ice, combine Gin, Limoncello, Bitters, and Clementine Juice. Stir vigorously to chill. Strain into a Rocks Glass and top with Soda.